Sharpen your blades as Devil May Cry 5 prepares for launch later this week on March 8th. Decide which version to get with our handy version comparison guide. The battle for heaven and hell reignites later this week when Devil May Cry 5 smashes onto our screens on March 8th. DMC5 will be available in 2 different versions and we've put together a guide to help you navigate all the bonuses with each. No matter which version of the game you get you'll also receive special pre-order bonuses! Not sure which version of Devil May Cry 5 to get? Take a look at our handy version comparison guide to help you figure out which one is best suited your needs! 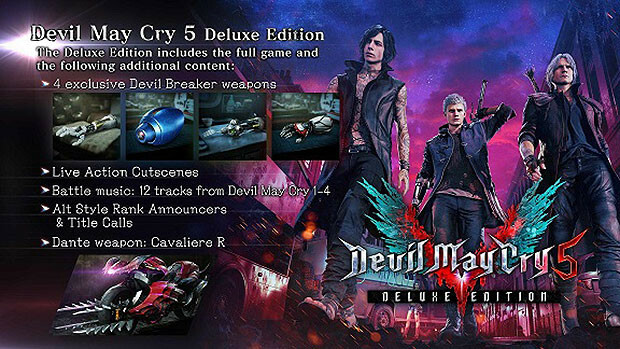 Those who purchase the Deluxe Edition will get themselves some extras including 4 Devil Breaker weapons (including the Mega Man inspired weapon), the Cavaliere R weapon for Dante, 3 tracks from each of the past Devil May Cry games, Alternate voices for the Style Ranks/Titles and the ability to swap to live action cutscenes instead of the final cinematics. Anyone who pre-orders a copy of Devil May Cry 5 from Gamesplanet will also get some extra hero colours for their characters, plus a DeviL May Cry 5 Wallpaper to kit out your desktop with. Those who pre-order the Deluxe version will also get an extra 100,000 Reb Orbs for use within the game. Devil May Cry 5 launches later this week on March 8th. You can pre-order either version today and save!